Greetings, dear readers! It's been an uneventful week around here as I recover from being sick. My kids were sick for a very short time without slowing them down much, but their germs have brought me down to my knees for days. Thankfully I'm on the mend and have been forcing myself to not do too much so I can recover quickly. Now on to today's blog post! 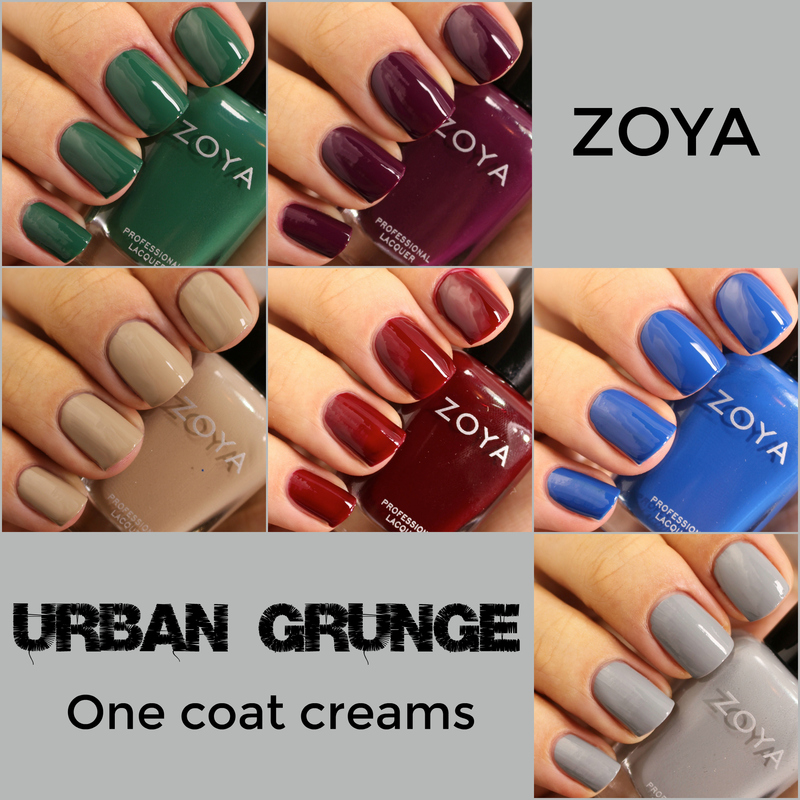 Zoya has recently released the Urban Grunge collection, and I have swatches of them for you this morning. Let's check them out! The first half of the Urban Grunge Collection consists of creams that are designed to be opaque in one coat. I wanted to see if they lived up to the claim and used only one coat for all these photos rather than my usual two to three coats. August is a full coverage gray like a fine, expensive leather with mid-ranged, balanced tone. I really dig this shade of grey! It's such a classy shade! As far as being one coat, it is a one coater if you tend to use thicker coats like I did here. I probably could have still used a second coat coat though, so you're probably better off biting the bullet and just going with two thinner coats. To be honest, I'm not really sure how anyone could get Courtney to apply to opacity with only one coat. The formula is on the thinner side, and I had some issues with cuticle flooding especially with attempting to apply this with only one coat. Courtney would best be applied with two, but more likely three, thin coats for opacity. Khaki coloured Noah is a beautiful neutral shade that can be worn by most skin tones. I'm not sure that it works the best against my olive skin tone, but that's neither here nor there at the moment. It does apply quite nicely to opacity with one coat. I used a thicker coat than I normally would have used, so it may be best as a two coater. Mallory is a full bodied, Prussian blue with deeply saturated color. This is such a pretty shade of blue! I was able to achieve an opaque look with one coat, a little thicker than I would have preferred, but still a single coat nonetheless. 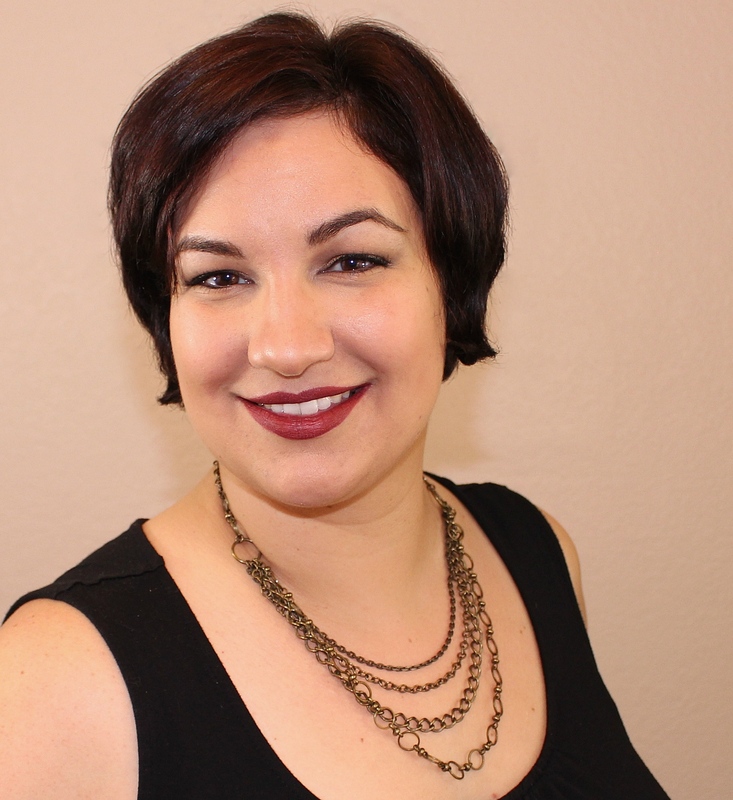 Like Courtney, Tara has a thinner formula that does not lend itself well to being a one-coater easily. It is doable, although my nails still would have benefitted with a second coat. Wyatt is a true racing green with a deep pigment, full coverage, and smooth application. I'm partial to this shade from the collection, and not just because my oldest son's name is Wyatt; it's a beautiful cool shade of green! I used one thicker coat here and had success with opacity. As you can see, it is possible to apply a single coat and achieve opacity with this half of the Urban Grunge Collection. Polish does need to be applied with a heavier hand than I care to use, but if you normally use thick coats, they should work perfectly for you. Now on the metallic holo half of the collection! I love a good red, and Ash is beautiful! Even better, the formula wasn't too thick or thin and I only needed one coat for opacity! This is the finish I think of when it comes to Zoya's holos! The formula is perfection with such smooth application, and the colour is majestic! Alicia is the star of this collection. While linear holos are very common with the indie polish world and occasionally seen in mainstream brands, this is the first time I've seen Zoya release a linear holo. I truly hope to see more of this finish from this brand because they delivered beautifully! For those of you planning winter weddings, this is the shade you want on your nails! Zoya does scattered holos so well, and Merida does not disappoint! I suspect this polish is going to be one of my most commonly used when it gets closer to the holidays! The formula was on point and the application impeccable. Now if the Zoya fairies can release a series of oranges with this finish, I would be thrilled! Britta is a berry metallic with a red and purple fuchsia flash. Densely pigmented, smooth application. Like Ash, I found Britta to be pigmented enough that I only needed one coat for opacity. If your nails are longer, you may find you need a second coat unless you typically use thick coats while painting your nails. The formula is on point and the colour a must have! Troy was, I admit, a disappointment for me. I usually really like metallic pewter and charcoal shades, but I found Troy to look better in the bottle; the colour somehow just seems to fall flat on the nails. The touch of gold, still present but subtle in the bottle, seems to just disappear completely in application. The formula was also on the thicker side, and I had to use two as thin as possible coats possible. I still ended up with slightly uneven looking nails. Overall the metallic holos half of the Urban Grunge Collection is a success with some great shades. I personally prefer the scatter holos of Finley and Merida with the linear holo of Alicia coming up very closely behind. 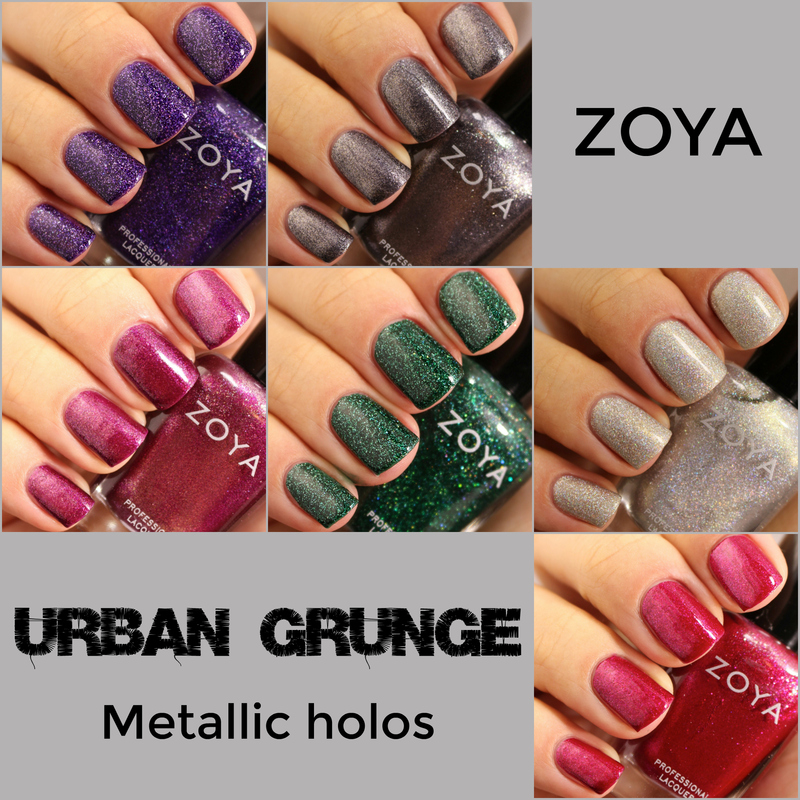 The Urban Grunge Collection is available for purchase from the Zoya website located here. Now is an excellent time to pick up your favorites as Zoya has a promo that runs through tomorrow. You can buy any 3 shades for only $15, the cost of shipping, using the promo code LUVFALL. If you spend $35 or more, shipping is free! It's definitely easy to pick out several shades from this collection to meet that minimum! What do you think of the Urban Grunge Collection? What shades are your favorites? Do you love the new-to-Zoya linear holo finish? I'd love to hear from you! Great review! I was especially excited about Wyatt as well, thats my youngest fur-kids name. :) And Im wearing Finley today, its perfection! Both are definitely great choices! Oh my gosh, I love this whole collection! Definitely my kind of colours. Great review and I will have a look into this brand. Definitely! Zoya has some wonderful colours to choose from and fun finishes! I like all these colors for fall! I think cremes look fantastic and I really like Finley and Merida from the holo side! Fall colours are some of my favorites, although I think it feels that way since I'm ready for fall when they come out, lol! Fantastic review! I wouldn't mind getting a few of these polishes! OH no, I really liked Troy! Beautiful swatches! Too bad about Troy. I liked that best!